Afshan Kirmani’s written this piece on ‘User Experience in India’ for UXMatters. I was one of those who gave inputs to Afshan for this story. The comments on the article are turning out to be worth reading as well. A banner ad on Facebook for SimplyMarry.com, a mirror of what’s part of day-to-day life/culture in most parts of India…(I especially like the use of the word “Mummy”)! Is this the only website in the world that virtually “closes down” for few hours everyday???? A classic case of technical limitations, rather than users’ needs, driving the specifications! *Nov 30: World Usability Day at the Indian School of Business, Hyderabad (I’ll be speaking at this event; details to be finalised, but the topic will ‘Design Research’ related). Among other things, I’m looking forward to visiting ISB’s awesome campus. If you know of other interesting events, related with Innovation/Design/Entrepreneurship/Research, please do let me know (email param[at]onwardresearch.com or please leave a comment here). I searched for the route from Old Madras Road to Cunningham Road. The good news is that Landmark-based driving directions (which RouteGuru kick started few months ago) seems to work as well as they do on RouteGuru. The “auto fare” is far from reality. 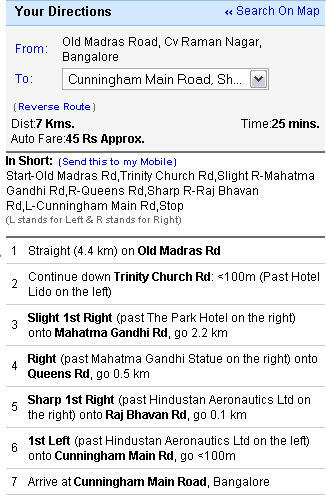 For the above route that I looked up, the “auto fare” displayed is Rs. 45!!! That was probably the fare several years ago!! Anyways, sarcasm aside, I thought the “auto fares” feature is a really good idea. But, it’s got to be implemented with a reality-check. You can’t release this feature without having tested it thoroughly with real-life data. Interestingly, I can see this feature working very differently in a city like Chennai. For those unfamiliar with Chennai’s infamous auto drivers, they don’t use the meter at all…it’s just a “flat rate”, depending on their mood or state of mind at that moment! So, as & when the Yahoo “auto fares” feature is updated with more realistic auto fares, this could probably be used by those in Chennai to figure out what’s the bargaining benchmark, especially for those who’re new to the city! With regards to the “Time” mentioned for each route, this is quite redundant, unless integrated with a real-time traffic monitoring system like MapUnity‘s BTIS application. Maybe it’s on the cards…who knows, but until then it’s quite a pointless, even misleading feature. In an attempt to go local in India, Microsoft’s Office website for India, is in Hindi by default!!! And, there doesn’t seem to be way to change the language to English while still being in the ‘India site’. This seems like a classic case of misplaced localisation. Wonder why somebody at MS hasn’t figured out selecting the India site doesn’t necessarily mean people want Hindi! There’s a sizable audience in the country that doesn’t know (and even aren’t too fond of) Hindi…I could see many of them getting really irritated on seeing Hindi, and more importantly, not being able to change it back to English (or to other Indian languages). How is ‘Design Thinking’ different? What do we get paid for? Voice SMS – wrong audience? The ‘Fly on the Wall’ is a year old!